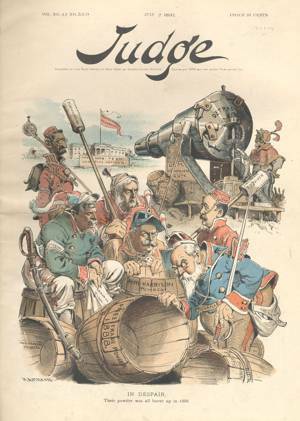 Cartoonist Grant Hamilton portrays the Democratic and Mugwump press as being out of political gunpowder for the 1892 presidential election. Comparing political campaigns to military ones was a common analogy used by nineteenth-century editorial cartoonists. This image is particularly similar to an 1880 Harper’s Weekly cartoon by William A. Rogers, "Now or Never—The White House or ‘Bust’ ! ,” in which that year’s Democratic presidential nominee, General Winfield S. Hancock, and his Democratic “officers” stand aboard a sinking raft, firing a dilapidated cannon at the Republican White House.